This monograph describes the South Slavic dialect of a village which is located about 6 km. south of the Greek-Yugoslav border and 10 km. from the town of Lerin (Florina). The author of this study, who is a professor of Slavic linguistics at the University of Hamburg, had the unique opportunity of living with speakers of the dialect for extended periods of time. This is the first exhaustive and authentic study of any microdialect in the Lerin region and is thus a major contribution to South Slavic dialectology. The book begins with a description of the locale, the circumstances of the work that led to the book, a discussion of the theoretical bases of the work, and some historical data. Following chapters cover phonology, stress, inflection and derivation, and syntax. The treatment of syntax, in particular, includes much more material than is usual in such studies. After this are four texts in transcription (mostly IPA) with interlinear translation, and then four letters written in Latin script by a native speaker who did not know Cyrillic. These letters are accompanied by interlinear transcription and translation. There is an 80-page lexicon with over 2200 items and an 8-page bibliography. 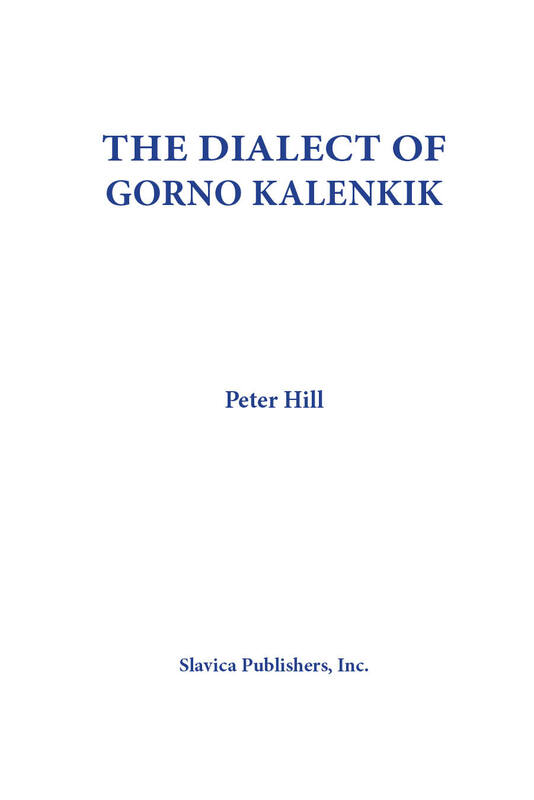 Professor Hill's book offers a description of the micro-dialect of Gorno Kalenik as spoken in the middle of the twentieth century. The description is synchronic and structuralist, although sociolinguistic questions and variation theory have not been disregarded. The work on this micro-dialect has confirmed once again that Lyons and others are right to speak of `the fiction of homogeneity.' In addition to the study which forms the main part of the book, a brief classification of the Lerin dialect and its subdivisions is offered. Since dialectological and sociological work on Slavic is not permitted in the Greek part of Macedonia, little has been published on the dialect of Lerin, and what has been published often presents material of doubtful authenticity in a theoretically unsatisfactory framework. Professor Hill's book will be of interest not only to specialists in the South Slavic languages, but also to Slavists in general, as well as sociolinguists.